I have been planning to write this blog post focusing on the Creation of the World ever since the media reported a few days ago that Pope Francis has walked away from the traditional view of the Catholic Church when it comes to the Big Bang Theory and Evolution. Now, after reading some of the most stupid articles written in recent weeks (with the media, it has become weeks since they seem to misinterpret the Catholic Church often), and after reading the most stupid one of all last night from a news agency that will remain nameless, since I do not want to bring scandal to your life, I found that I had to give you what the Catechism of the Catholic Church teaches on Creation. 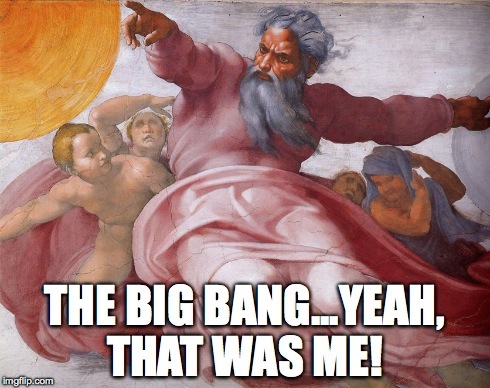 Just so we are crystal clear: what Pope Francis said about the Big Bang Theory and Evolution…it’s not new!! His predecessors have written and spoken on this very subject before. Venerable Pope Pius XII, in 1950 mind you, wrote a document where he spoke about evolution. It’s titled, Humani Generis. This document was written seventeen years after the Catholic Priest and Mathematician, Georges Lemaitre, developed this theory. When the media claims that Pope Francis has left the views of the Catholic Church on evolution, they should be completely ignored. They have no idea what they are talking about…as usual. CCC 315: In the creation of the world and of man, God gave the first and universal witness to his almighty love and his wisdom, the first proclamation of the “plan of his loving goodness”, which finds its goal in the new creation in Christ. CCC 316: Though the work of creation is attributed to the Father in particular, it is equally a truth of faith that the Father, Son and Holy Spirit together are the one, indivisible principle of creation. CCC 317: God alone created the universe, freely, directly and without any help. CCC 318: No creature has the infinite power necessary to “create” in the proper sense of the word, that is, to produce and give being to that which had in no way possessed it (to call into existence “out of nothing”) (cf DS 3624). CCC 319: God created the world to show forth and communicate his glory. That his creatures should share in his truth, goodness and beauty – this is the glory for which God created them. CCC 320: God created the universe and keeps it in existence by his Word, the Son “upholding the universe by his word of power” (Heb 1:3), and by his Creator Spirit, the giver of life. CCC 321: Divine providence consists of the dispositions by which God guides all his creatures with wisdom and love to their ultimate end. CCC 322: Christ invites us to filial trust in the providence of our heavenly Father (cf. Mt 6:26-34), and St. Peter the apostle repeats: “Cast all your anxieties on him, for he cares about you” (I Pt 5:7; cf. Ps 55:23). CCC 323: Divine providence works also through the actions of creatures. To human beings God grants the ability to cooperate freely with his plans. CCC 324: The fact that God permits physical and even moral evil is a mystery that God illuminates by his Son Jesus Christ who died and rose to vanquish evil. Faith gives us the certainty that God would not permit an evil if he did not cause a good to come from that very evil, by ways that we shall fully know only in eternal life. For a further and more complete understanding of the Creation of the World, I would encourage you to read CCC 279-314. Also, check out the conference with Pope Benedict XVI titled Creation and Evolution from Ignatius Press. In the end, we must pray for those who “report” the news to us. Solid, sound, researched journalism seems to be a dying breed these days. Let us invoke the intercession of St. Francis de Sales, the Patron Saint of Journalism, and St. Gabriel the Archangel, Patron Saint of Messengers, since it’s the media that presents messages to us. Thanks for your insight on the media. I couldn’t agree more. As for universe, there is no factual explanation. The Catechism of the Catholic church gives us all the explanation we need.